An ornamental drop usually attached singly or with others on a bracelet. They can be mementos of travel, flat discs engraved with dates and sentiments, novelties, sports-related, gem-set or whimsical. Collecting charms for bracelets was popular during the 1940’s and 1950’s. Forty miniature charms depicting almost everything under the sun. From a kettle drum to a spinning fan to a small menagerie of animals, etc. 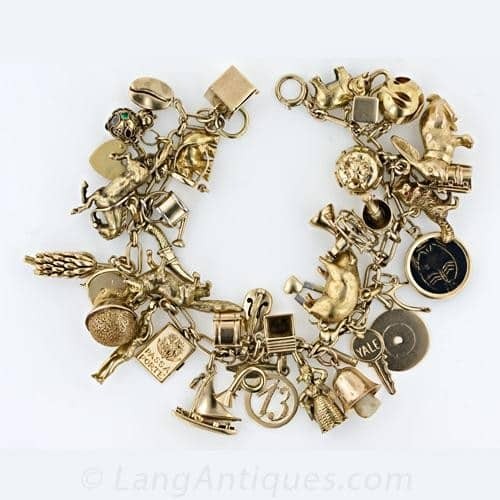 the charms are tightly spaced and jingle-jangle on this extraordinary charm bracelet from the 1940’s – 1950’s.